Meanwhile at Camelot King Arthur held a feast at Easter: but before the knights of his court would be seated at the long table in the hall, a great strife broke out between them as to where they should sit – for they counted it a greater honour to be near the head of the table than near the foot. They came at last to the banqueting hall, and there Merlin awaited them, standing before a great round table of wood and stone which filled it almost from side to side. 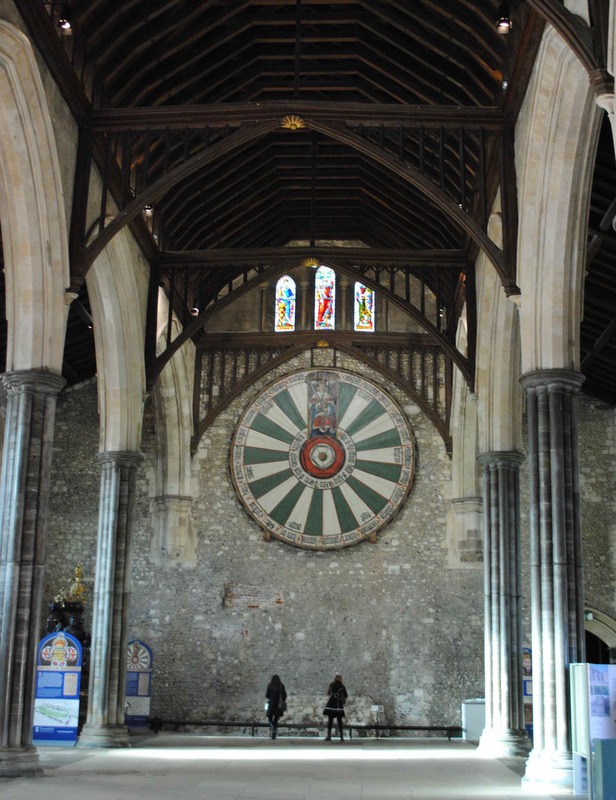 With a licence more than poetic, the website for Winchester’s Great Hall claims possession of ‘the iconic Round Table – famously linked to the ancient legends of King Arthur and his Knights.’ What the visitor actually sees, hung at the Hall’s western end, is a 13th century recreation, probably made for a tournament held by Edward I. Medieval English kings liked to dust themselves in Arthurian mystique from time to time, and it was Henry VIII, as part of the refurbishments for a visit by the Holy Roman Emperor Charles V, who had the Tudor Rose and the portrait of Arthur (said to bear an uncanny resemblance to Henry himself, though I couldn’t tell from where I was standing) added to the Winchester table. There is no mention of the Round Table in Geoffrey of Monmouth’s The History of the Kings of Britain (c.1136), the founding text of the Arthurian stories. Later that century the Norman poet Wace produced Roman de Brut (c. 1155), which adapted and summarised Geoffrey’s work in Norman French and was intended for as a kind of history guide for the new overlords of the Anglo-Saxon possession. Wace included the Round Table in his version, but where he got the story from is obscure. In Wace’s account, the introduction of the Round Table to prevent strife among his knights was due to Arthur himself, and not Merlin. A Worcestershire priest called Layamon then took Wace’s text, augmented it and made a native Middle-English verse work of it. In Brut (c.1190) Layamon expanded on the Round Table’s origins. Arthur hosts a Christmas feast (in London, of all places, and not Camelot) and the ‘strife’ of Roger Lancelyn Green’s version is altogether more brutal. A food fight at table turns into a fist fight and then swords are drawn. At least seven knights, and by implication many more, are slain. Arthur’s retributive justice is swift and equally brutal. The survivors, along with heir male next of kin are executed, and their nearest female kin have their noses cut off. After this bloody business, it is a Cornish craftsman who proposes the Round Table to Arthur as a means of preventing future squabbles, and that same craftsman who builds it. In these early accounts the Round Table is a means of a conflict resolution and a symbol of knightly equality. As the Arthurian stories developed and later authors, particularly Sir Thomas Malory, brought in the Grail legend, the symbolism of the Round Table changed. According to Lewis Freeman Mott (in his book The Round Table) the table at Arthur’s court became the third of a group of three symbolising the Trinity, the other two being the table of the Last Supper and the table which Joseph of Arimathea made to receive the Grail. Mott also links the Round Table to British agricultural festivals which once took place around stone or turf-cut circles. There are other layers of religious symbolism associated with circles, of course. ‘God is a circle whose centre is everywhere and circumference nowhere’ is a proposition that recurs in medieval theology. In his essay ‘Pascal’s Sphere’, Jorge Luis Borges traces some of the history of the idea, from Alain de Lille’s hopeful ‘God is an intelligible sphere, whose centre is everywhere and whose circumference is nowhere’ to Blaise Pascal’s almost despairing ‘[Nature is] ‘a frightful sphere, the centre of which is everywhere, and the circumference nowhere.’ Similarly, the Arthurian legends have achieved eternal habitation in that other infinite sphere, humanity’s collective imagination.